The Canal and River Trust has announced that it aims to re-open Marple Locks by 29th March. The lock flight on the Peak Forest Canal has been closed since September due to serious subsidence at Lock 15, resulting in a narrowing of the lock chamber. There was movement of the lock wall, with a risk of collapse. The work is complex, with the need to dig boreholes to assess the nature of the work needed. The job has been further complicated by the confined space in which to carry out the work and the need to follow procedures for working on a Heritage Grade II Listed structure. The lock gates have been removed and the chamber filled with stone to stabilise the wall while the ground behind is excavated. 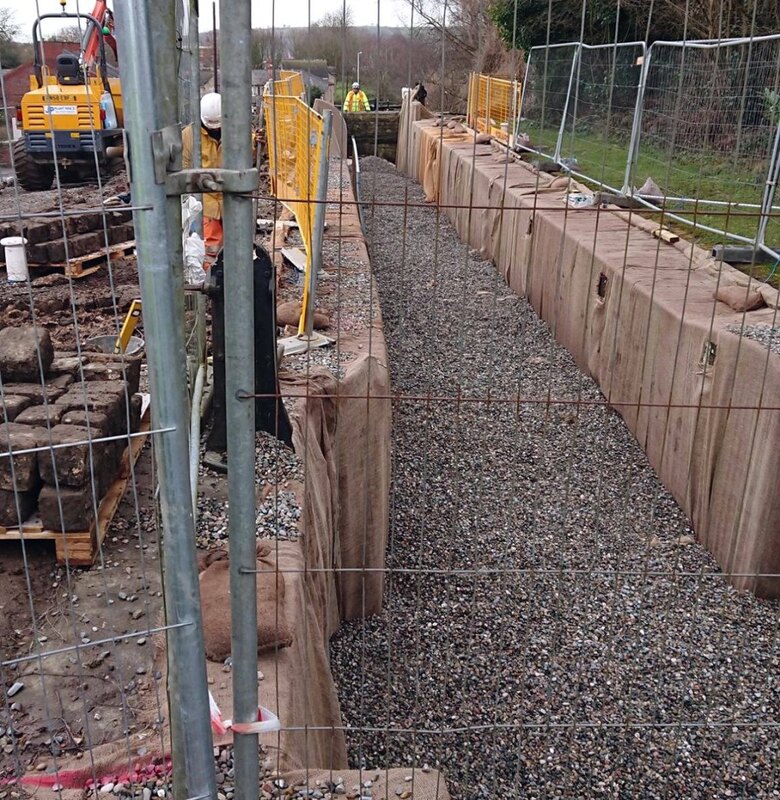 A retaining wall will be constructed and the lock wall rebuilt. The retaining wall will eventually be out of sight within the structure. With fabric to protect the stones, the lock chamber has been filled with stone to stabilise the wall.Photo: Ian McCarthy. 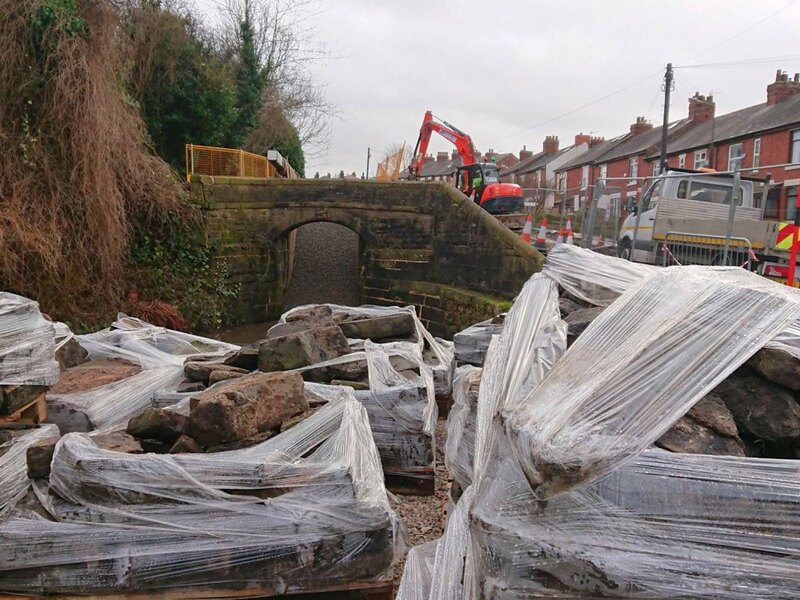 While the Marple locks are closed, CRT is taking the opportunity to carry out a number of other repairs to the locks and bank, and the controversial safety work at Marple Aqueduct. CRT will not now be able to meet their anticipated opening date of 29th March, but now hope to re-open the lock flight in time for May Day Bank Holiday on 4th May. Thanks to Ian McCarthy for the photographs and additional information. Please feel free to comment on this item. If you do not have a Blogger/Google etc account, then please click on "Name/URL" and type in your name or nickname. If you have no URL you can leave that part blank. Please do not post as "Anonymous". This blog features waterway news from around the area covered by the Pennine Waterways website. Pennine Waterways website is dedicated to the canals of the South Pennines, UK, including photographic virtual cruises along these canals. Please feel free to add your own comments about news items. Click on the "comments" link under a particular item. For more information about the canals in these news items, please visit the home page of Pennine Waterways website.